The media now speculate that we are closer to a solution of the Cyprus problem than we’ve ever been before. I may not necessarily agree, but I can’t help but wonder how our lives would change if the island is reunified – both Greek-Cypriots and Turkish-Cypriots living together in harmony. Being a post-war child, I have never experienced what that was once like. In fact, from childhood leading into my army years, I was taught to hate Turks and everything they stood for. It is clear to me now however, that if there is any hope for reunifying the island, feelings from whatever happened in the past, must be put aside. For my summer holidays this year, I decided to spend 9 days visiting Constantinople. Istanbul (not commonly known that this is Greek for “Εις την Πόλη”, or “To the City”), is a remarkable city from a historical perspective. Remnants of the Byzantine era and the Greek influence are abundant in the vast majority of the city’s historical landmarks. What really impressed me however, is the church of Hagia Sophia itself, a former Christian patriarchal church, turned into an Islamic mosque and now a museum visited by over 3 million people every year. Looking around from the inside, one can’t help but notice the various Christian and Islamic religious symbols all blended together. The Christian mosaics on the walls which are now slowly being restored, standing side-by-side to the Islamic mihrab and minbar that were later added. That made me wonder whether that was simply an analogy of life in the unified Cyprus that some of us envision. Needless to say, I came back with more questions than I had before. This is picture of the Blue Mosque as seen from a window on the second floor of Hagia Sophia. Shot handheld with my Canon 60D and Sigma 18-200mm F3.5-6.3 OS lens, at ISO 200, F7.1 at 1/1250 sec and bracketed at -2/0/+2. 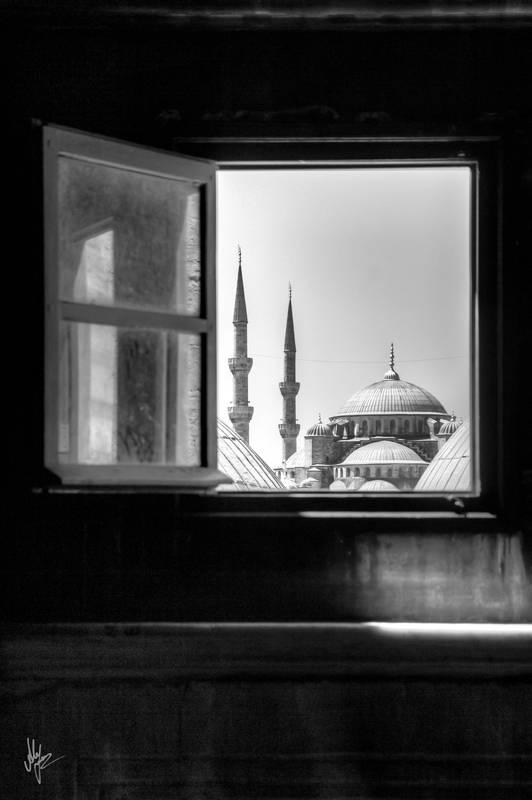 This entry was posted in My shots and tagged Agia Sophia, alexis thomas, B&W, church, Constantinople, cyprus, Greek, Hagia Sophia, HDR, Istanbul, Mosque, photography, Travel, Turkey, window by Alexis Thomas. Bookmark the permalink.